On Roanoke Island, the legend of the 114 people who mysteriously vanished from the Lost Colony hundreds of years ago is just a story for the tourists. But when the island faces the sudden disappearance of 114 people right now, an unlikely pair of 17 year-olds may be the only hope of bringing them back. 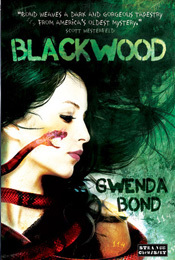 Blackwood by Gwenda Bond is an entertaining mystery story that surrounds the legend of Roanoke Island. Bond has taken the legend and all the speculation about what really happened and created intriguing characters and backstory to not just fictionally explain the original occurrence, but delve into a modern day repeat of the disappearances. The main character Miranda has an incredibly mysterious past, considering her family is disliked by almost the entire island, she’s apparently cursed, and she’s not sure why. You’d think she’d know something like that. Miranda’s a likes able enough character, she’s sincere and tough, a lady geek and self-sufficient. But she has crazy ideas about relationships, if you ask me. Phillips, the main boy and love interest, is a nice enough guy. Very sweet and capable in weird situations. But he is the catalyst for Miranda’s school life being crap, and she hasn’t seen him in three years. They get together pretty quickly, disembodied voices, curses and disappearances aside. The story sets up a nice mystery, not all the details are released at once and there is sufficient suspense to keep you turning the pages and wanting to know what will happen next. Things seem pretty hopeless and desperate until the end (of course), but Miranda and Phillips keep hoping for a good ending, and so does the reader. The addition of the FBI agents who are investigating the disappearances and Miranda’s father in particular are an odd addition, especially since they think Phillips, and Miranda, are to blame (for some weird reason). Blackwood by Gwenda Bond is a creepy and well-imagined take on the Roanoke mystery, with good writing and an interesting plot. While the were some factors that hindered my overall view of the book (including Miranda’s overuse of the word frak), I still found it an enjoyable read and would recommend it to any fan of historical mysteries and magic. Also, can I just say that I loved the Supernatural references, especially since they did that Croatoan episode? Very cool. ARC provided by Strange Chemistry in exchange for my honest review. Thank you!